Joe Marshall had two brief stints in the major leagues, appearing in ten games with the 1903 Pittsburgh Pirates and in 33 games with the 1906 St. Louis Cardinals. Marshall was considered by many as one of the top power hitters in the minor leagues, and early in his career acquired the moniker Home Run Marshall. In 1903, while playing for the San Francisco Pirates in the Pacific National League, Marshall led all of Organized Baseball with 25 recorded (actually 26)1 home runs, an astonishing number during baseball’s Deadball Era (the major-league leader that year was Boston’s Buck Freeman with just eight homers). During a professional career that spanned 17 years, Marshall also tried his hand at managing and team ownership. Marshall’s whereabouts in 1898 are unknown, but by 1899 he was playing on an independent team in Helena, Montana. Joe began the 1900 season with the Helena club in the Montana State League. On August 3 he was traded, along with $200, to league rival Great Falls for Joe Tinker, a future member of the Chicago Cubs’ Tinker to Evers to Chance infield. No complete player statistics were ever published but the league did release the leaders in various batting categories at the halfway point (the Montana State League employed a split-season format) and at the conclusion of the second half of the schedule. Based on these reports,3 Marshall had 22 doubles, 13 triples, and 7 home runs in 1900. His season was cut short when he contracted typhoid fever in September. One of the unusual aspects of Marshall’s career was that of the 18 professional teams he played for, John McCloskey was his manager in eight different seasons on seven teams, including the 1906 St. Louis National League club. McCloskey had the reputation of building pennant-winning teams in the West, often moving from one team to another every year. McCloskey would take the top players from his former team with him to his new team, and Marshall was one of the players who routinely followed McCloskey. 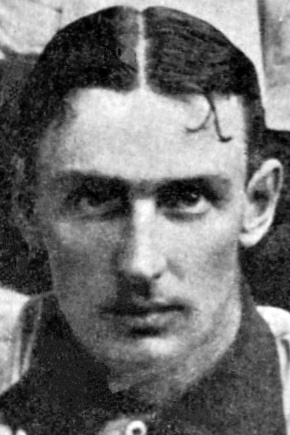 McCloskey was often accused of stealing players from other teams, but steadfastly claimed that he would pursue players only after they had been released by their former team. Marshall spent the 1901 season with Spokane of the Pacific Northwest League, acting as team captain and even taking over as manager midway through the season. He had a solid season, batting .291 with 15 home runs. It was announced Marshall would stay in Spokane after the season as he had secured employment for the winter. However, Marshall purchased his own release5 in order to reunite with McCloskey for the 1902 season, this time with Butte (Montana), also in the Pacific Northwest League. The next season, 1903, Marshall and three other players, including former major leaguer Farmer Weaver, followed McCloskey to San Francisco, where Joe had his best season. In addition to his 26 home runs, Marshall hit .343 and his 282 total bases and .601 slugging percentage were tops in all of baseball, majors or minors. It is impossible to know how many of Marshall’s home runs cleared the outfield fence, and how many were of the inside-the-park variety. But he was known as a notoriously slow baserunner, and that, along with his weak defensive abilities and his refusal to slide, were thought to have prevented him from spending more time in the major leagues. Conflicting reports had Marshall spending the winter of 1903-04 in either Spokane, Tacoma, or Butte. Nonetheless, he signed with San Francisco again that winter and was paid $200 advance money. But when spring training rolled around, Marshall asked for his release from the club. Rather than being released, he was suspended by San Francisco and he was “now restrained from playing professional ball.”7 His former manager, McCloskey, paid some undisclosed amount to satisfy the San Francisco club and get Marshall reinstated. Sometime in the spring of 1904, Marshall “submitted to an operation in Portland” and “if he recovers his strength, he will play with McCloskey this year.”8 Marshall did eventually join McCloskey in Boise, Idaho, in the Northwest League but was still inactive and on crutches in June. When he recovered sufficiently to return to the lineup, he hit .345 for Boise with ten home runs in 83 games. He finished the season with Portland in the Pacific Coast League before being released on October 20 to take a position in a pool hall. In 1905 Marshall followed McCloskey to Vancouver in the Northwest League. He hit .298 with a league-leading seven home runs in 73 games before asking for and receiving his release from the club in early August due to disagreements with team management. He was so discouraged that he was quoted as saying he was “through with baseball” and returned to his home in Spokane. In the spring of 1906 Marshall was working in a poolroom in Butte, but after McCloskey was hired as the manager of the Cardinals, he persuaded Marshall to join him in St. Louis. Marshall was with the big-league club from May until August and hit just .158 in 33 games. Marshall joined the Tacoma club in the Northwest League in 1907 and played independent ball in Butte in 1908. In 1909 he was playing for and managing the Boise, Idaho, club in the Inter-Mountain League, a team in which he owned a half-interest. The team moved to Butte in July but the league disbanded a week later, and Marshall finished the season playing independent ball in Livingston, Montana. He was out of professional baseball in 1910 but was found umpiring games in Boise, Idaho. Joe reunited with McCloskey again, and returned to Organized Baseball in 1911, this time back in Butte. There he had one of the finest seasons of his career, hitting .320 and finishing second in the Union Association in home runs (12) and slugging percentage (.548). In 1912 Marshall was scheduled to join Butte again, but was suspended by manager Charles McCafferty when he failed to report by April 23, Opening Day. Marshall was upset with his contract, claiming it was $50 per month less than he had agreed to, and said he “would not play for any such money.” He finally reported in mid-May but played in just a handful of games before being traded to league rival Ogden, Utah, which was managed, not surprisingly, by his old friend John McCloskey. Now 36 years old, Marshall hit .243 with just one home run in 29 games for the season. “Home Run” Joe played one more season, 1913, with Butte, hitting .275 in 114 games with no home runs before retiring from professional baseball. A Joseph H. Marshall is listed as a clerk in the 1904 Spokane city directory, and as a cashier in 1905, likely his offseason occupations. A World War I draft card for a Joseph “Hurley” Marshall, with the same birth date as Joseph Hanley Marshall, February 19, 1876, listed his residence as Butte and his occupation as miner. By 1936, Marshall was living in La Habra, California, and according to the 1930 Census was listed as still being married, and a patient at Norwalk State Hospital (now Metropolitan State Hospital), a mental institution, in Santa Monica, California. He apparently had been released from Norwalk by 1931, and died at Santa Monica Hospital on September 11, 1931,9 at the age of 55. Home Run Joe Marshall and is buried at Rosedale Cemetery (now Angelus-Rosedale Cemetary) in Los Angeles. 1Per SABR member and researcher Carlos Bauer, SABR-L listserv, December 3, 2012. 3Anaconda (Montana) Standard, July 24 and November 25, 1900. 4Anaconda Standard, August 4, 1900. 5Anaconda Standard, January 31, 1902. 7Seattle Daily Times, May 5, 1904. 8Seattle Daily Times, March 24, 1904.